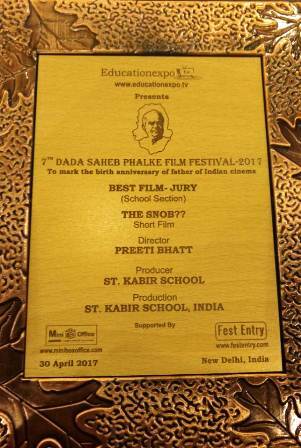 On 30th April, St. Kabir School, Ahmedabad won the prestigious Dada Saheb Phalke award for the “BEST FILM – JURY” at the 7th Dada Saheb Phalke Film Festival held at Delhi. The film titled “The Snob “ was selected among the 150 short listed films which successfully made up to the screening ceremony at the film festival, out of a large number of entries of 800 films, both Indian as well as international. The film got a big round of applause not only at the end of the film but also midway during some touchy moments of the film which added to the “wow” factor! Click here to view the FILM …The SNOB ?? 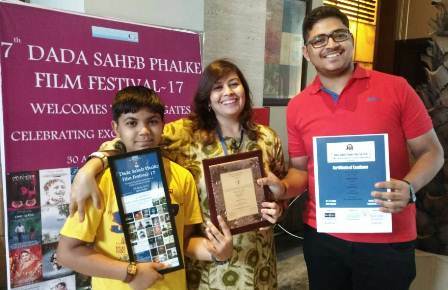 The school proudly applauds the efforts by the budding students of the Film Making Team which is growing commendably under the mentorship of the Creative Advisor of the School -Ms. Preeti Bhatt whose professional expertise in the fields of writing, directing and acting in theater has tremendously helped the team……..and hence this AWARD!!! Kevin Shah, ( Std VII Naranpura Branch ) the 12 year old editor of “The Snob” mentioned that during the process of editing, he realized that editing was a lot more than just cutting and pasting and it played a great role in making of a good film. His father mentioned that his recent discovery about his editing skills has now made him introspect about his future career plans. Father of Mann Raval, ( Std IX Naranpura Branch ) the camera person of the film said , “ I am really indebted to the school management for introducing such innovative grooming lessons in the school and giving exposure to my child’s hidden talents. After two consecutive wins, St. Kabir School is all set for a hat trick next year! We wish the Film Making Club all the very best for their up- coming ventures!